...complete car care you can trust! Keeping an eye on your cars's vital signs and maintaining them at healthy levels will increase driving performance and simultaneously help to reduce maintenance costs and untimely major repairs. Outlined below are some helpful tips on how to properly monitor and maintain your car's major vital signs. In addition, we show you where to look under the hood and elsewhere for signs of potential trouble. Please make sure to check your owner's manual for the exact location of your car's vital components (including fluid tanks) for the make and model of your car. • Engine Oil: This is the lifeblood of your engine. Check your oil dipstick regularly (Remember to clean the dipstick with a rag when you first remove it and then to reinsert it and withdraw it again to get a true read on your oil level). If you continually need to add oil, consult your technician immediately. Other trouble signs may include the oil having a "foamy" appearance or a strong gasoline odor. Check your owner's manual for the location of the oil dipstick. • Transmission Fluid: Check your transmission fluid dipstick while the engine is running. The color should be pink or red. If it appears brown or has a burnt smell, have it checked immediately. 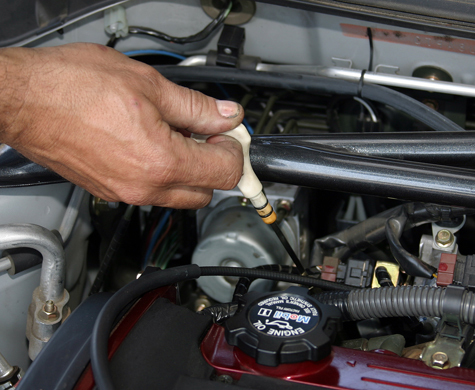 • Power Steering Fluid: small dipstick can usually be found attached to the cap of the power steering fluid reservoir. The fluid should stay level. If you need to add fluid, have it checked as soon as possible for a leak. • Brake Fluid: Do you know where the brake fluid is located? In most cars you'll find it in an opaque chamber under the hood, right in front of the steering wheel. If your brake pads are starting to wear, the brake fluid level will drop. If the fluid drops below two-thirds full, have it checked. Note: Be careful with brake fluid as it will damage your paint!! • Coolant: When you check the coolant, make sure your car has had time to cool down. Two marks ("Full Hot" and "Full Cold") can be found in the reserve tank. If you need to keep adding water, you probably have a leak. The engine can be damaged from overheating, so make sure that the reserve tank contains adequate coolant and never allow your car to redline. • Windshield Washer Fluid: You can check the windshield washer fluid level by looking at the marker on the opaque chamber or by looking into the reservoir. If your car's battery permits you to check its water level, you should check it frequently. If your car, however, contains a more modern "maintenance-free" battery that doesn't require water level surveillance, you can still maximize battery power by keeping the top of the battery clean and corrosion-free and by keeping the battery terminal connections tight. Four factors affect tire wear and durability: tire inflation, tire balance, alignment, and rotation. Make sure your car is equipped with a handy tire gauge so you can check each tire's pressure frequently and especially in colder weather. To keep the tires wearing evenly, make sure each tire maintains proper inflation. If your tires are out of balance, the car will vibrate at speeds between 50 and 70 mph. When one part of the tire becomes heavier than the other, an imbalance occurs. Wheel weights, properly placed by a technician, can help compensate. Once the wheels regain balance, your ride will become noticeably smoother. Upon inspection, if you notice uneven tire wear, the steering wheel off center, or the vehicle pulling to either side, then you will likely need an alignment. Tires wear at different rates and in different ways, front to rear and side to side. Rotating them regularly will extend their tread life. Tires should be rotated in the proper sequence based on the type of drive system your vehicle has (front wheel, rear wheel, all wheel). Consult your owner's manual for the proper sequence of rotation or simply call Tommy Mathewes Auto Repair and we will be happy to assist you. Driving through areas with heavy air pollution and dust can clog the air filter. 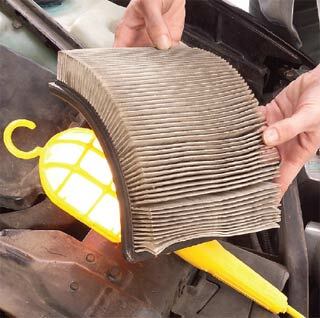 So, your car's air filter will require replacement on a frequent basis. The air filter cleans the air entering the engine. More modern cars (those built after 1993-94) also contain an interior air filter that will require regular replacement to optimize air circulation and protect the heating and air conditioning system. The fuel filter keeps fuel clean so your engine can operate at peak efficiency. It should be changed by a technician. The breather and PCV valve permit clean air to enter the crankcase and to burn in the combustion chamber. This diverts moisture and acids away from the engine. You don't realize that you need new wiper blades - until you are in the middle of a downpour. Wiper blades streak when they get old or dirty which can impair the driver's windshield vision. Make sure to change your windshield wiper blades every 6,000 - 10,000 miles or every 6 months and clean them each time you wash your windshield. A clean windshield can increase wiper blade life. Your car's finish is under constant assault by weather, tree sap, bird droppings, road salt, pollution, etc. Washing your car and keeping it clean will help protect it from these corrosives. When washing your car, avoid hard brushes and laundry or dishwashing detergents that are too harsh for your car's finish. Instead, use soft brushes and mild car-wash soap. Waxing is the final touch that keeps a car looking new. 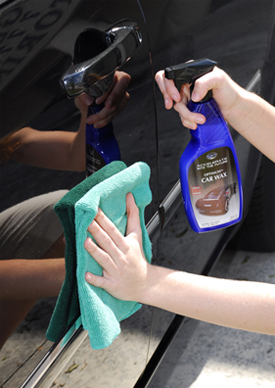 In fact, a ten-year-old car that has been waxed regularly can yield a better shine than when it was brand new. That's the power of wax! To maintain the best shine, smooth your car's surface with a clay, pre-wax product prior to each waxing and hand-wax your car at least twice a year. When moisture beads fail to appear on your car when it gets wet, it is time to wax your car again.